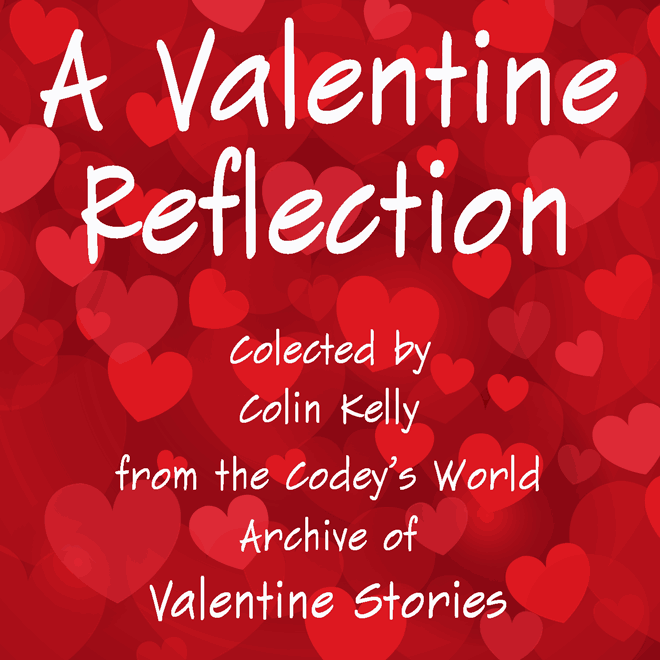 This is the Codey’s World 2017 Valentine story anthology, titled A Valentine Reflection. I hope you enjoy reading these stories. It’ll be Valentine’s Day 2017… soon. Our posting schedule doesn’t coincide witth the day of hearts and candy and flowers and going out to a very nice restaurant for dinner with your spouse, boyfriend, girlfriend, BFF, or just a friend or neighbor. So we've searched our archives and found Valentine stories — a baker’s dozen of them — that we’re posting as this week's Featured Stories on Codey’s World as A Valentine Reflection. We hope you enjoy them, perhaps with someone who will also enjoy them, as much as I enjoyed finding them for you. If you enjoy these stories, please let each of the authors know! Authors thrive by the feedback they receive from readers. It's easy: just click on the email link found usually at the top of each story to send the author a message. Say “Hi” and tell them what you think about their story. Thanks! These stories and the included images are Copyright © by the authors and the providers of the images. They cannot be reproduced without express written consent. Codey's World web site has written permission to publish these stories. No other rights are granted. The image on this page is licensed and is Copyright © by lenchik87 | Adobe Stock File #77126627.